In 2013, NJLS and the New Jersey Lawyers Diary and Manual completed a comprehensive analysis of overnight delivery costs among two major courier companies: UPS and FedEx. The data concluded NJLS has a significantly less expensive overnight delivery service—with savings ranging from 50% to 80% compared to the standard and special published rates of the two major overnight couriers. The average savings per attorney in the state of New Jersey are $1,800 per year. 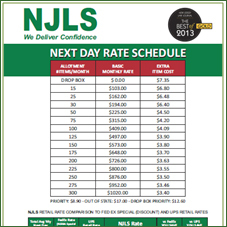 For a detailed overnight courier rate schedule for NJLS Next Day and NJLS Drop Box Locations, download the PDF. Fuel Surcharge** is updated monthly based on retail prices published by the U.S. Energy Administration. **We reserve the right to amend these charges at any time.